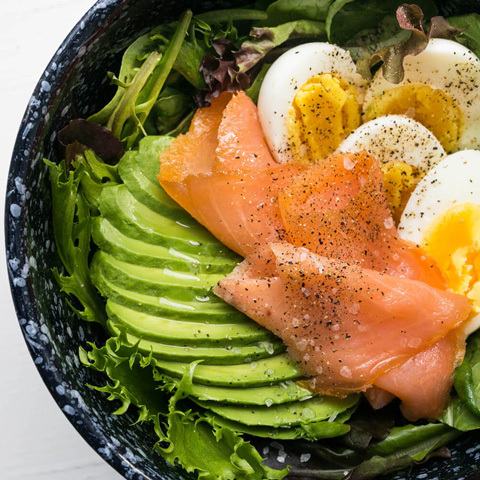 A fat-packed, ultra low-carb meal plan to kick the body from glucose dependency to ketosis. Our 7-day Ketogenic Diet is a healthy twist on a 'typical' keto diet which is usually packed with dairy products and lacking in vegetables. This meal plan is completely dairy-free. Instead of relying on cheese as a staple ingredient for low-carb recipes, we've included a wide range of more nutrient-dense, high-fibre ingredients. Net carbs are approximately 30g/day or less. We have acknowledged the difference between fibre and other carbohydrates, as fibre is not digested and converted into glucose. The vast majority of carbohydrates on this plan come from fibre, so they will not prevent ketosis. They will, however, support a healthy GI-tract and make for a happier, healthier client. This Ketogenic meal plan is designed for the purpose of promoting general health and wellness through ketosis. It is not intended to treat epilepsy or any other type of seizure disorder.